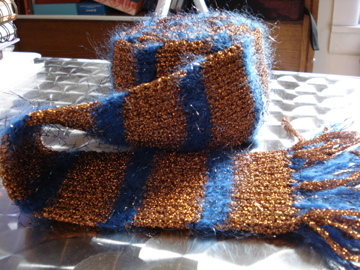 So way back, right before the release of the final Harry Potter book I started knitting this so I would have something to do while waiting in the very long line at the scholastic book release party. Sadly I lost one of my needles down the subway grate I was sitting on about 30 minutes into waiting. 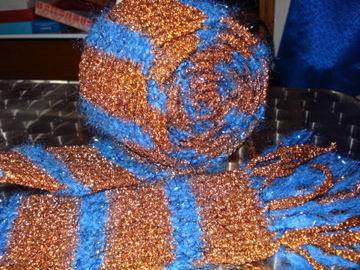 It is the first in a whole series of future HP scarves, because who can resist making a Harry Potter scarf when you read the books. 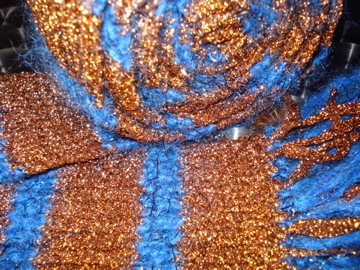 Finish with 12 rows of copper. (optional) add fringe, braid or leave it plain. 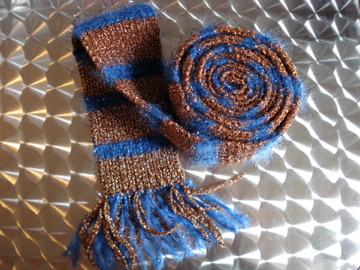 If you choose to add the Stardust as fringe you must knot the end of each strand to avoid some nasty unraveling.